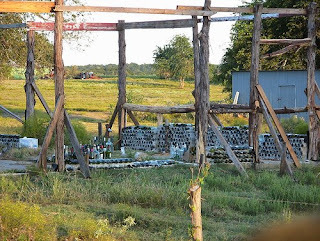 The first photo was taken in 2007 in Milano, Texas and is the framework and beginning of a bottle house. I'm not sure if was finished, but intend to check into it. The second photo is, I believe, an older bottle tree, but I can't remember where I found it... so not sure of location. I'm not sure why, but I cannot seem to get the photos to post where I want them... but I suppose this works too. Following is an excerpt from wikipedia giving a brief history of the bottle tree. 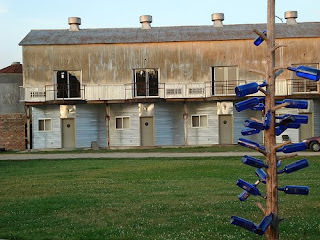 I've never seen a bottle tree. My mother used to collect colored bottles and put them on the window sill. Bottles are pretty bland colors here: brown, clear, and sometimes green. Colleen: Bottle trees may be an acquired taste! I've always liked folk art... outsider art... not positive, but it may be more popular in the south. I have a bottle tree that I created by using nails in a dead cedar that stands atop one of my gardens. all my garden "treasures" are organic in nature, in that they are either concrete stepping stones that I did tile mosaics on using reclaimed or "throw-away" tiles from big box stores, making beautiful and comfy stepping stones. I googled orgin of bottle trees today after a friend who teaches shamanism all over the world had seen my tree and told me the origin from Africa. Bottles were hung by strings upright, however, originally, as I understand. Just dangling about. Mine survived high winds on edge of Hurricane Rita a few yrs ago; has done well, not lost a bottle yet.